The newly redesigned ISB Sof-Touch-2 Palm Button replacement is the gentle way to initiate your machine's cycle. Sof-Touch-2 is a totally self-contained direct replacement for conventional mechanical spring loaded palm buttons. Sof-Touch-2 ergonomic palm buttons require no physical pressure to initiate a machine cycle, therefore they substantially reduce repetitive motion trauma such as carpal tunnel syndrome. 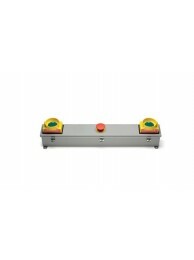 Electronic detection of operator's hands for force-free actuation of machines utilizing error free detection technology. Modern surface mount technology circuitry for high reliability. Sensitivity is auto-adjusted on power up for reliable detection of fingers, even when wearing gloves. Automatic drift compensation; sensitivity not affected by temperature, humidity, or supply voltage variations. 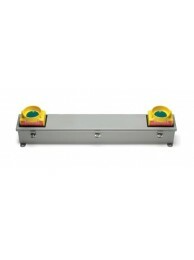 Automatic reset and auto-calibration if object is detected continuously for more than 60 seconds. Power supply allows for 1 model to handle 12 - 26 VDC or 12 - 250 VAC. Fast reaction time of less than 15 milliseconds. 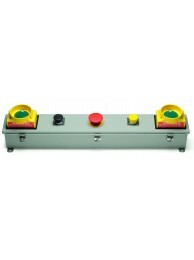 Dual redundant force guided safety relay contacts in each button. All circuitry, including output relays are contained within the housing, allowing for easier installation, even on a flat surface. Input Power: 12-250 VAC at 3 Watts Max. or 12-26 VDC at 3 Watts Max. Outputs: Normally Open and Normally Closed Contacts are redundant force-guided safety relay contacts with a mechanical life of 10 million operations.